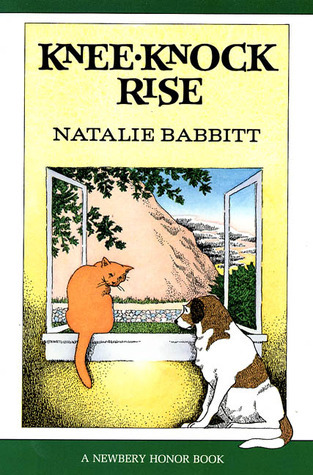 I'm beginning to wonder if there exists a Natalie Babbitt book that I won't like. I picked up Kneeknock Rise at Goodwill for a nice little price after reading The Search for the Delicious and Tuck Everlasting (both linked to my review). I find Babbitt to be a deep thinker with a great deal of wit and have enjoyed the previous titles I've read. As she writes more towards middle grader readers, her books are extremely easy for adults to breeze through. It took me all of an hour to read Kneeknock Rise and the ending left a smile on my face just like her other stories have. In this particular story we meet Egan, who is sent by his mother to visit his aunt and uncle in Instep. Instep is a small mountainous village which boasts being the home of a legendary monster, referred to as the Megrimum. The people of Instep are very afraid of the Megrimum who lives at the top of the mountain. This creature comes down during storms and threatens the villagers who protect themselves with charms. Egan becomes determined to see if he can find and kill this Megrimum and upon reaching the top of the mountain he discovers there is a reasonable and natural explanation for what the villages hear and attribute to the monster. Although this is a grade school book, it asks some deep questions. The story is not neatly resolved at the end either! The question about what truth is remains when the covers close. Like her other stories, this isn't one that easily fades into the background of life, quickly forgotten. It lingers a bit. I find her books make curious book club choices because they are easy reads which ask tough questions, making them fun to discuss and think about. This title is no exception. Of course, I can only speak to a few of her titles, but I recommend Kneeknock Rise along with the other I have read. Intriguing writing and story telling! I'll be looking forward to another of works when an opportunity presents itself! I tried reading Tuck Everlasting once and somehow wasn't able to get into it--but I loved The Search for Beautiful. My library has Knee-Knock Rise, so I think I'll add it to my TBR list and see when I get to it. The combination of simple reading and deep thoughts sounds wonderful! Knee Knock Rise sounds like a great book for us to get into as a family! I love your book reviews! I, too, picked this up at Goodwill awhile back. I think I gave it to my daughter, but maybe we'll try it as a read aloud. Haven't read this one, but it sounds interesting. I just recently read this too. I thought it was great!